Connect Camp: Moving Past VBS! We had a great VBS this year. We hosted over 250 kids and raised $413.80 for our IMB missionaries. And everything from the snacks to crafts went well. I had several parents tell me their kids had an amazing week! I am very thankful for all those who selflessly served to make VBS 2015 a resounding success! For more infor about VBS 2015 Click Here! But our work is not done. Almost 25% of the kids who came to VBS this year were unchurched. That’s right, at least a quarter (though I suspect the the percentage is far higher) of the kids who came to VBS were unsaved. And, they came to us. Seeking to take full advantage of this incredible opportunity to reach Eastman, FBCE launched Connect Camp on July 2. 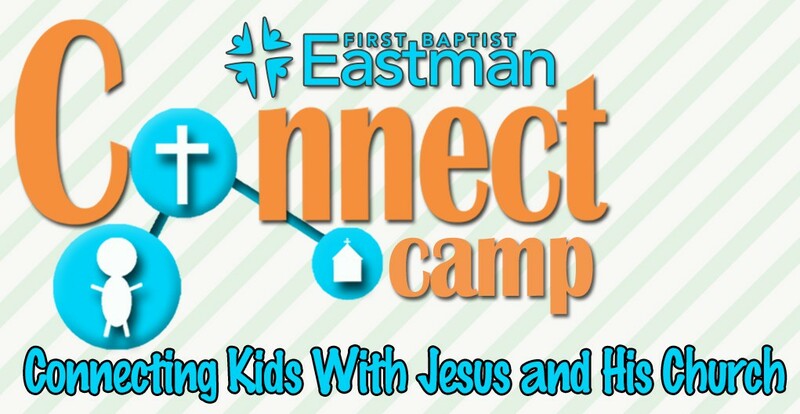 Taking place the on the first four Thursday of July, Connect Camp exists to help the members of FBCE develop the relationships that began during VBS. From 8AM-12 Noon, we will be connecting with kids through art projects, bouncing basketballs, and learning sign language. And, we hope that loving the kids of Eastman will open doors for gospel proclamation. Our ultimate goal for Connect Camp is to see kids and their families connect with Jesus and his church. Please join with us through prayer and/or by serving with us on Thursday mornings. Click here for more info about Connect Camp.